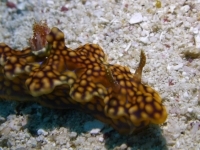 Conspicuous nudibranch with a scalloped outline of the body, green body color and sometimes a red variation, with a blue reticulated pattern. 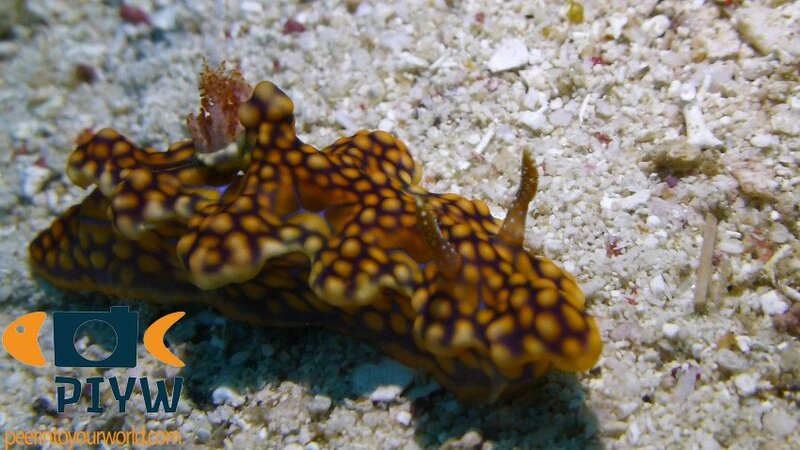 Rhinophores are the same color as the body with spots on it. Unassessed by the IUCN Red list, but considered an uncommon species. They can be found from East Africa, to the Indo-Pacifc, up to Australia, New South Wales and the Hawaiian islands. They prefer hard substrates, rocky surfaces and often in close proximity of sponges of the genus Dysidea, in a depth range of 0-30 meters. They are simultaneous hermaphrodites and either individual can act as a male or female. They lay eggs that hatch into larvae and grow into adults. It feeds on sponges of the Dysidea genus. In the posterior and anterior lobes, there are glands that can secrete toxin, used as chemical warfare to chase off rivals.